> artifacts such as postage stamps, coins, and a national flag. This is also an interactive art project – real people can claim a building site on New Island, build a dream house or retreat, and thus own a part of this island-nation. 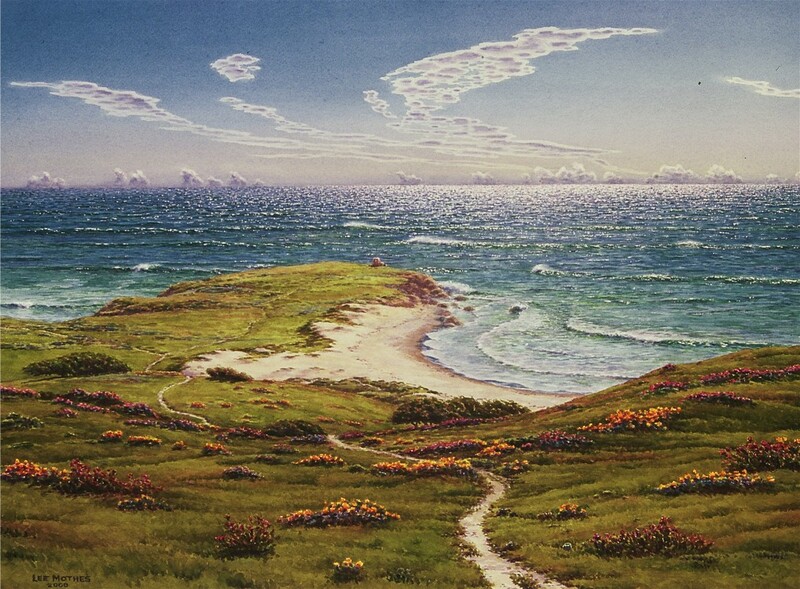 With an increasing desire to be someplace else, Lee Mothes began to visualize the island in 1995. Lee wanted a place with a lot of beaches, an agreeable climate, and friendly, English-speaking locals. 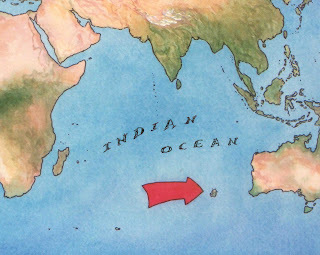 He found an ideal site west of Australia after researching the geography, climate and history of the south Indian Ocean. Once the site was chosen, He was then able to write the island's history, and create a detailed road map. Lee then wrote a guide book, produced coins, a flag, and then more maps, many landscape paintings, a few stories about local events and about a visitor named Alan Faramond. People have found delight in the fact that they can create what they want here - an unleashing of creativity that can be very liberating! New Island from 450 miles up. The Commonwealth of New Island is situated in the southern Indian Ocean some 950 miles west of Cape Leeuwin, Western Australia. Known more commonly as New Island, the island stretches 140 miles north to south and about 90 miles east to west, with a total land area of some 12,600 square miles, including its offshore islands. Here is where it is! The official New Island travel map. New Island’s climate is blessed with sea breezes and seasons similar to those of California or South Africa. The land-forms are old and have weathered long enough to create sandy shorelines, varied high-country, bird-filled marshlands, and fertile hillsides and valleys. New Islanders are primarily of English, Scottish and Irish origin, with some Russian and Japanese influence in the island's history. The locals have rediscovered ways of living with each other and with nature that go back thousands of years. 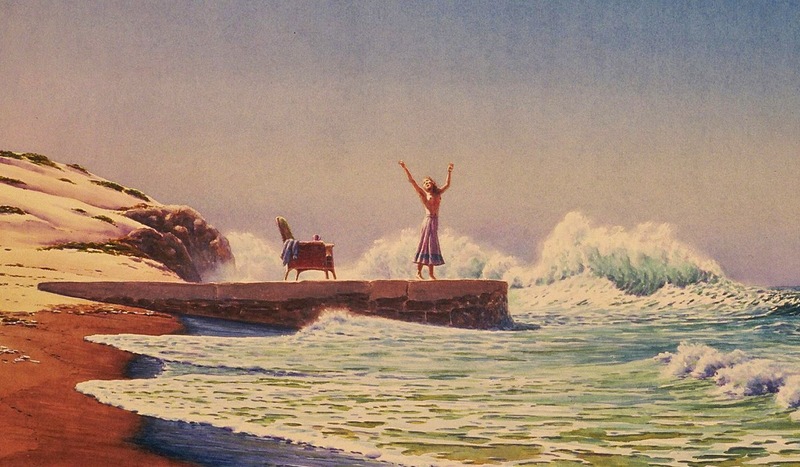 Mostly emerging from shipwrecks, they arose to provide well for themselves with their gardens, farms and creative ventures; and they have learned to find a relaxed sense of joy. Their cities and towns provide modern amenities, including running water and electricity, but have a peculiar old-world look to them. Everyone on the island has an equal say through local representation; regulatory government is minimal. Because of their long isolation, New Islanders have learned to protect the island’s forests, rivers, and wetlands. The island’s residents have their quirks, oddities, and unusual points-of-view; while they willingly help each other, live sustainably, and sometimes find joy. A typical New Island landscape, on the eastern coast at Wave Point. 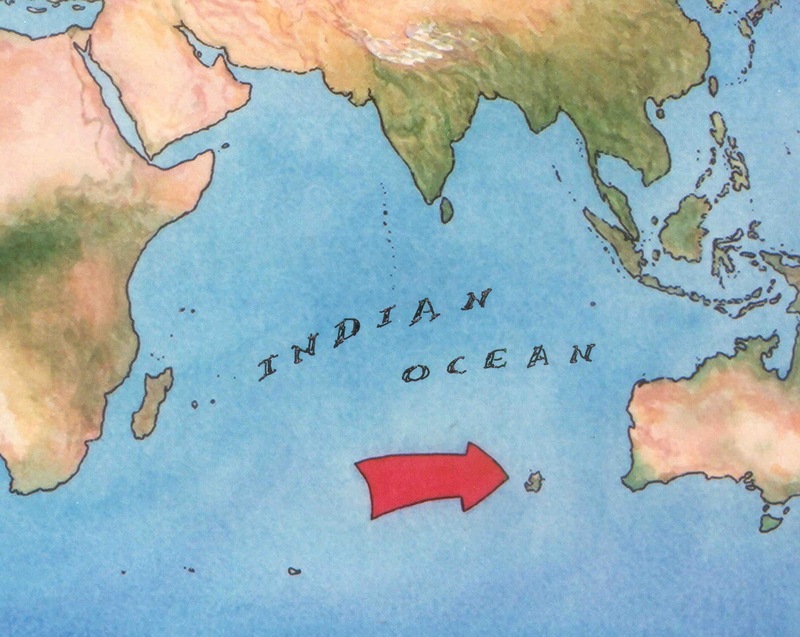 What if there was one more island out there, situated in the southern Indian Ocean about 950 miles west of Cape Leeuwin, Western Australia? 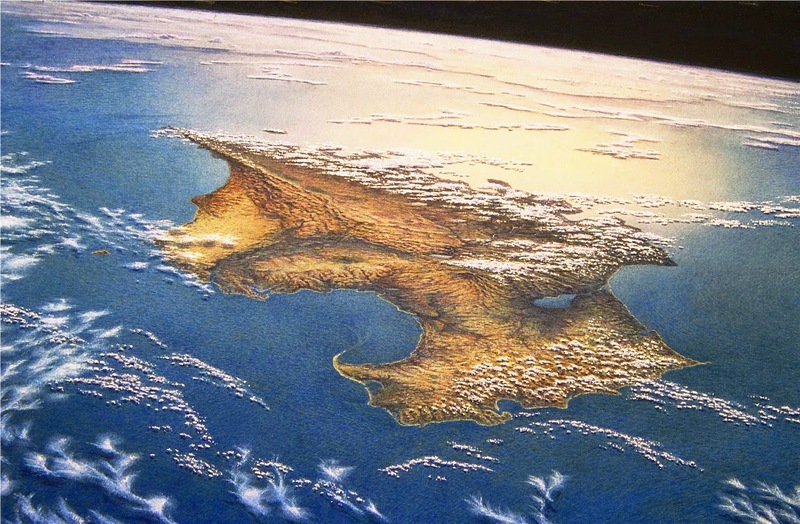 Suppose it was rather large, with varied climate zones, an ancient geography, and capable of supporting a self-sustaining human population of several thousand. Given the region’s actual climate, history, and surrounding geography, what animals, birds, plants and sea-life would be found there? And who might live there? Every place has a history, and where people are involved, some kind of a culture. New Island is no different. The real history of this part of the world would determine what might have occurred on an island situated here. An early nautical map, originally from the Russian explorer Fabian von Bellingshausen. There could have been a long-lost paleo-culture that left ruins and riddles. There could have been two ships loaded with petty-crime convicts and supplies that wrecked on the island’s southeast shore in 1799. At least one ship could have been predominantly filled with women on their way from England to the penal colonies of Australia. A large bamboo raft bearing nineteen Japanese fishing families could have, over three years’ time, found its way from Kyushu, Japan, to the island’s eastern shore in 1807. There could have been an arrangement, in 1820, with the Russian government and the island’s residents, to allow the island’s culture to develop on its own, and meanwhile keep the British navy, as well as other European powers, at bay. The Russians, and later the American CIA, could have conspired to remove the island from nearly every map of the region. When the Soviet Union collapsed in 1991, the islanders could have negotiated their independence with a hoard of gold salvaged from a Spanish ship burned in 1830. 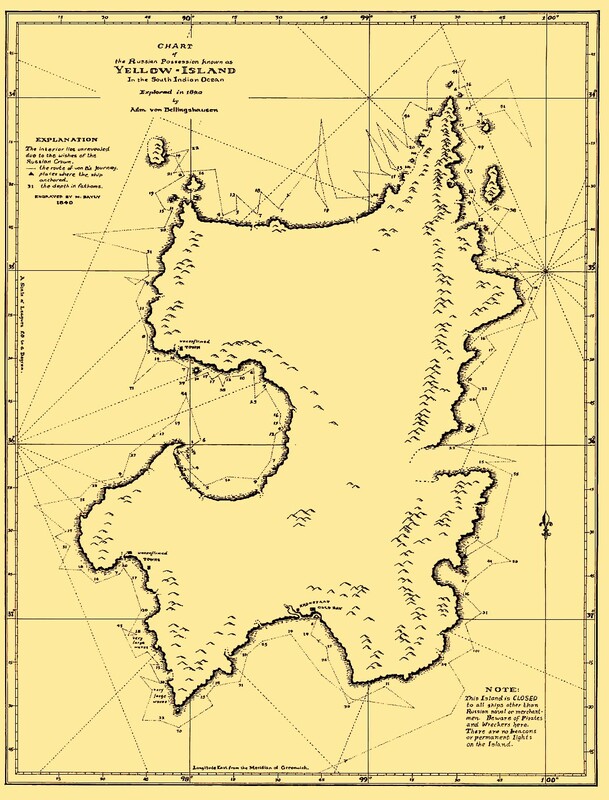 These what-ifs and could-haves make up the Commonwealth of New Island today. 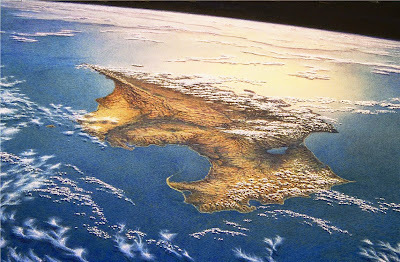 The place-names in the maps and guidebook, the historical artifacts and documents, and the landscape of the island are all the result of what could or might have occurred from the Late Jurassic period to this day.